L = 189, external L embouchure = 33.5, external W = 25.5, internal diam embouchure = 22 by 21 mm; distal end L = 6.5, W = 6, fingerhope opening = 3.5 mm. Binding strips W = 4, cord diam = 3.5 to 5.4 mm [RTS 6/12/2004]. Collected by Percy Horace Gordon Powell-Cotton and his wife Hannah Powell-Cotton (nee Hannah Brayton Slater) on 16th February 1933 during a shooting expedition. Small notched end-blown flute carved from the end of a bushbuck horn, that is a slightly translucent, greenish brown colour (Pantone 7504C). This has been hollowed out and consists of an embouchure with concavely-cut front and back edges, rising up at the sides and producing an almost triangular plan view. Two pieces of a dark brown resinous material have been added to these raised sections inside the mouth, as a means of modifying the width of the aperture; there are two further patches down one side of the exterior, although these may be accidental as they look to have no particular function. The body tapers in below and twists slightly, following the natural shape of the horn, which has been cut off just above the tip, creating a narrow oval-sectioned distal end with a circular finger-hole at its base. Part of the upper body has been wound round with thin orangey brown flat strips of plant fibre (Pantone 729C), knotted at their ends to fasten them, and attached through this knot to a length of fibre cord (Pantone 7509C). This cord has been made from double strands of grass fibres, twisted together, and tied in a loop around the flute just above the fibre binding. It also passes through this binding's knot, connecting the two elements, is knotted off itself, and then its two loose ends join to become a thicker cord that hangs down the side of the object, becoming thinner towards its lower end, which has not been tied off. The horn is complete, but the upper part shows signs of surface damage and weathering. It has a weight of 40.2 grams. The flute body is 189 mm long, with an embouchure that measures 33.5 by 25.5 across its outer edges, and has an internal diameter of 22 by 21 mm across. The distal end is 6.5 mm long and 6 mm wide, with a finger-hole diameter of 3.5 mm. The binding strips are 4 mm wide, and the cord varies from a diameter of 3.5 mm (single) to 5.4 mm (where doubled). The cord extends to a length of 335 mm from the place where it has been tied around the horn body. Collected by Percy Horace Gordon Powell-Cotton and his wife Hannah at Logoforok on 16th February 1933, during a shooting expedition. This type of flute is called lapile by the Sudanese Lango. Driberg describes how the (Ugandan) Lango wore some flutes: 'A leather noose is slung over the shoulders round the neck, and attached to it at the back is worn a ‘tail,’ called alyam (generally made of the bristles of the warthog), or sometimes three ‘tails’ united by a metal ring, and the horn of a young bushbuck or ram fashioned into a war whistle' (J.H. Driberg, 1923, The Lango, p. 62). This appears to have been a simpler version. Accession Book Entry [p. 248] 1934 [insert] 8 [end insert] - MAJOR P. H. G. POWELL-COTTON , Quex Park, Birchington, E. Kent. Specimens collected by himself & Mrs Cotton, during hunting trips, 1933, viz: [...] [p. 256] - From the LANGO tribe, LOKOFOROK, LOMULENG & LOMO. [insert] 96 [end insert] - Lapile , notched whistle of Bush-buck horn, mouth piece shaped with gum, terminal stop. LOKOFOROK (357). Additional accession book entry [p. 257] - 1934.8.96, number given HLR, l[ength] = 18.4 cms. Card Catalogue Entry - EAST SUDAN Lapile , notched whistle of bush buck horn, mouth piece shaped with gum, terminal stop. Coll. by donor and his wife during hunting trips, 1933. Related Documents File - Typewritten List of "Curios Presented to Dr. Balfour by Major & Mrs. Powell-Cotton. Lango Tribe". This object appears as item 357: "Whistle, bushbuck horn, with plaited grass string, native name Lapile , 16/2/33 Lokoforok, 3. 47 N 33.5 E”. Also contains details of a cine film 'some tribes of the Southern Sudan', taken by Powell-Cotton during this 1933 expedition, copies of which are now in the National Film and Television Archive and the Powell-Cotton Museum in Kent [RTS 14/3/2005]. Pre-PRM label - 357 D [collector's label made from reused brown card, tied to object; RTS 6/12/2004]. 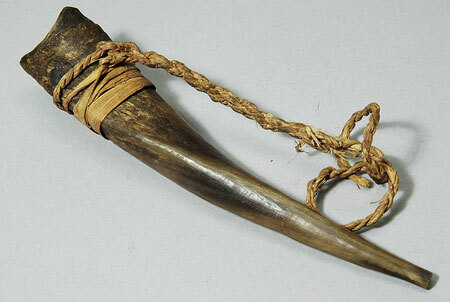 Old Pitt Rivers Museum label - Lapile , notched end-whistle, of bushbuck horn. LANGO, LOKOFOROK, E. SUDAN. 3 47' N., 33 5' E. d.d. Major Powell-Cotton, 1934 (357) [rectangular metal-edged tag, tied to object; RTS 6/12/2004]. Sparks, Rachael. "Lango flute" Southern Sudan Project (in development). 03 Jan. 2006. Pitt Rivers Museum. <http://southernsudan.prm.ox.ac.uk/details/1934.8.96/>.